Clarksville, TN – The Roxy Regional Theatre marks its 27th year of annually presenting the works of William Shakespeare with a story of envy, revenge, love and, ultimately, redemption. 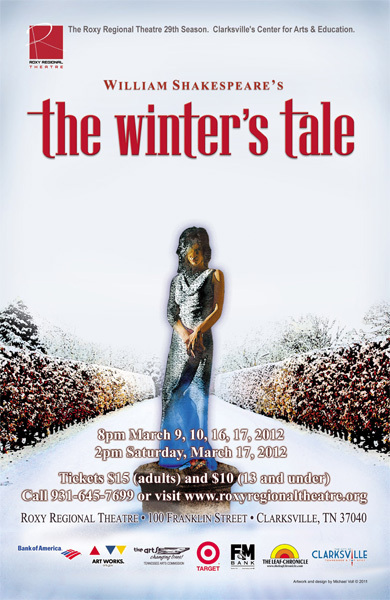 “The Winter’s Tale”, one of the Bard’s late romances, opens Friday, March 9th, at 8:00pm for a pay-what-you-can preview. In this tale edited by Brandon Meeks, the jealous King Leontes of Sicilia nearly topples his own kingdom when he falsely accuses his queen of adultery with his childhood friend, King Polixenes of Bohemia. In his foolishness and rage, he loses his wife, his son, and his baby daughter. The cycle of life and the power of true love come alive upon the Roxy stage, as a family is reunited, both physically and spiritually, through the power of forgiveness. Directed by John McDonald and starring Colin Ryan as Leontes, Evy Gildrie-Voyles as Queen Hermione and Brandon Meeks as Polixenes, “The Winter’s Tale” also features Josh Bernaski as Antigonus, Ryan Bowie as Camillo, Hannah Church as Emilia, Jay Doolittle as the Shepherd, Ted Jones as Autolycus, Travis Kendrick as the Clown, Ashley Laverty as Paulina, Gregory Pember (by permission of Actor’s Equity) as Florizel, and Kendall Anne Thompson as Perdita. 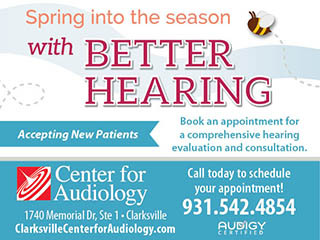 This production is made possible in part through the generous support of the City of Clarksville. “The Winter’s Tale” runs March 9th through March 17th, playing Fridays and Saturdays at 8:00pm, with a 2:00pm matinee on Saturday, March 17th. Tickets are $15.00 (adults) and $10.00 (ages 13 and under) and may be purchased online at www.roxyregionaltheatre.org, by phone at 931.645.7699, or at the theatre during regular box office hours (9:00am to 2:00pm, Monday through Friday). The performance on Friday, March 9th, is our regular pay-what-you-can preview; all tickets not pre-sold at the regular ticket price will go on sale at 7:30pm for whatever price you wish to pay.